In a historic vote delegates of the American Institute of Architects (AIA) overwhelmingly voted down Resolution 15-6 which called for AIA to support a new investigation of the destruction of World Trade Center building 7 on September 11th 2001. The resolution, which was introduced by AIA member Dan Barnum FAIA, was voted down overwhelmingly by a vote of 3892 – 160 meaning 96% of the delegates voted to ignore the science, the facts, and the evidence which is today common knowledge about the destruction of WTC 7! That’s right. 96% of voting AIA delegates voted with intentions and goals outside the realm of science and reason. Could it be that to 96% of AIA delegates two planes CAN symmetrically destroy three massive towers at freefall speed through the path of most resistance? Can it be that to 96% of AIA voting delegates a 47-story state-of-the-art tower CAN disintegrate at freefall speed due to ordinary office fires? If this was really the case, would you trust these people to build the apartment building you live in or office building you work at? We are a professional – not a political – organization. But in this case, if we vote “no” on this resolution, we are making a political decision, not a professional one. Thank you very much. And Dan Barnum is quite correct here in that clearly these delegates are not voting with science and reason in mind, but with political interest instead. Perhaps they were afraid of the consequences of voting for the resolution. Very likely many of them had no understanding of the nature of the WTC collapse even as admitted by NIST (National Institute of Standards and Technologies). Many of them were propagandized by voices repeating WTC destruction theories including theories that even NIST has disavowed like the diesel fuel theories. Anyone following the global political scene for any length of time, who is aware of the globalist plans for a new world order and aware of the long history of U.S. government/globalist false flag attacks should be taking notes to improve your knowledge of how these false flags are not only carried out but how they live on for many decades. Many of us understand how the 9/11 false flag attack on America on September 11, 2001 was very well planned out. We have seen how the mainstream media and many ministries including almost every prominent news paper, magazine, TV, entertainment and news media network have all cooperated relentlessly with the censorship of 9/11 truth. The censorship we speak of IS the greatest story of 9/11. This is what our children and the younger generation should know. The censorship of 9/11 had to be secured and guaranteed BEFORE the event was pulled off. And like the great cooperation we’ve seen from the CIA-controlled Western media on the issue of 9/11, here we are 14 years later and the most influential organization representing Architects all over the country still submits to the 9/11 official story mind control ‘voodoo spell’ when it comes to voting for action to investigate the obvious controlled demolition of WTC 7. The split between reality and fiction that divides those who think critically and those live for the control system and the rewards it hands them in this life could not be any greater. Unfortunately, this is where we are historically, and it is up to us to continue the great battle of information against the machine that is uniquely designed to deceive and enslave the masses. It is up to us to face the reality that the globalist criminals which pulled off 9/11 would not have moved forward with the operation had they not had the assurance of censorship and cooperation from organizations like AIA. Anything less would probably have been a reason to delay the operation. Let’s remember it has been over 50 years since the murder of president John F. Kennedy and here we are and we still don’t have justice served on the murder. This should serve as a reminder that these government false flags are not easy to overcome. They take many generations to overcome; and, thus, patience and persistence is required. The 9/11 truth movement has accomplished many things over the last 14 years. Most people in America today don’t believe the official story. There is probably no topic of government conspiracy which has been more written about, and has had more documentaries and movies made about it. Today the topic to many people is now old and forgotten, yet to this day we see the same level of top-notched censorship we saw in the early days after the event. The recent 96% AIA delegate vote against 9/11 truth is a reminder that whatever real gains we have with 9/11 or any government conspiracy and corruption issue will realistically be solved by resorting to solutions that start at the smallest level not at the higher levels. Let us also remember that perhaps this disappointing vote is a stepping stone to something much better down the road. History has confirmed many times that the road to truth is always very long and difficult. The powers that be will fight to the end to hold onto their power, and the last thing they want in this case is for WTC 7 to be brought under a microscope by the mass majority of American people. They don’t want the obvious visual collapse to be scrutinized and brought into question and thus brought into the mass consciousness of the people. This decision by AIA is also a reminder that 9/11 is a special issue in that the general public has been conditioned to accept the blind 9/11 official story pseudo-science without questioning it. The power of hypnosis is real as is the power of mass mind control. Let us be reminded that the truth of 9/11 for many Americans who were there is apparently still too difficult to face. Sadly, for many who lived through the event and still believe the 9/11 official story (as we have seen with JFK), many of them will die never having understood the truth of 9/11. For this reason, as we grow and learn and as we slowly make government obsolete, as humanity continues to rediscover itself and awaken to the globalist (new world order) plans, the voices of those still asleep will increasingly be irrelevant. Their opinions are slowly becoming obsolete, their ad hominem logic, voodoo-like hypnotic Orwellian reasoning will slowly but surely join the ranks of retardation and psychopathy, no pun intended. All of this serves to remind us that we live in a complex multi-dimensional world which I’ve written about before. Those still stuck in the 9/11 official story and those still believing in mainstream media government scripts do so because they receive the information in a single ‘linear’ dimension. Meaning when they hear mainstream media news, since they think in only one dimension, their brain cannot expand on the information to apply multi-dimensional critical thought and logic to the information. Instead the CIA psyop buzz phrase “conspiracy theory” blocks this process and they subsequently never get past the single-dimensional thinking process. Thus they fail to see the multi-dimensional component of the world they live in. I’ve learned to account for this engineered mental deficiency in my own interactions with these people. 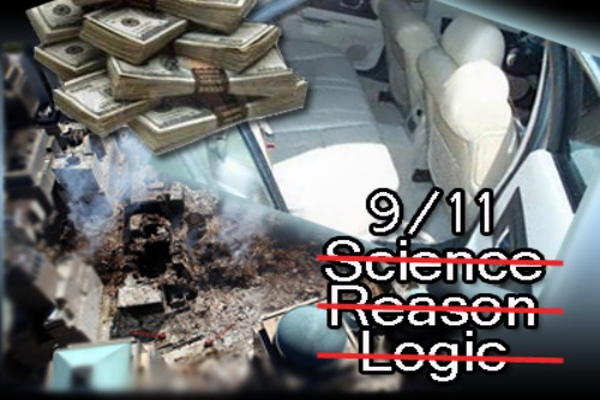 I do not “debate” 9/11 truth with the remaining individuals who still believe the official story. In my opinion they really are slowly shifting to a category of human suffering from a mental disease. The disease is inflicted by a governmental control system which has employed its experiment on the masses for a long period of time using sophisticated media and mind control tactics and technology. Truth really is realized and mass hypnosis, mind control and propaganda really is real. In order to see the reality of this, one must disengage from ones own ego and image of self and try to line yourself with simple truth. When you do this you will recognize that those who experienced 9/11 and still believe the official story really are suffering mentally even though they may be well-meaning people. (I’m not referring to people who haven’t actually seen the evidence I’m talking about those who do oppose the hard evidence after seeing it.) I do not believe however that it is proper to notify them of this reality because this reality will only be received as an insult (how could it not?). Instead learn how to separate the factual world you live in versus the interactive (people to people) world that surrounds you. As truth seekers we must interact with 9/11 official story believers in a way that sets aside your ego and hopefully pushes them toward the truth even if not immediately. As truth seekers we must also identify and acknowledge the proper level of mental functionality and clarity required for the topic so that we know how to best navigate our interactive skills with those around us. Finally, let’s continue thinking in multiple dimensions, acting in wisdom within the knowledge and understanding that we have about 9/11 and about global events today, because doing so will allow us to stay sharp, educated, remain realistic about the future and allow us to stay positive about the eventual outcome of our future. This positive outlook will in turn allow us to enjoy our current lives while we live. Enjoying our current lives while living in truth will thus allow us to push the growth of humanity in the direction of positive solutions. This is the overall goal after all. All solutions in my opinion must follow the Learning Trivium – First there is the Information and facts, then there is the Understanding which is the synthesizing of the information to be received in the proper context, and finally there is the Wisdom or action phase when truth seekers take action to change the world based on the understanding of the information they have. Let us therefore keep pushing the information which acts as a seed and spawns the first phase of the awakening and eventually the revolutionary action process which brings about change.